​I understand at the time of my booking a 50% non refundable deposit is required to secure my chosen date for my birthday party. I further understand that a credit card is required to be on file and will be charged the balance owed the week preceding my party. If any additional charges are accrued (i.e. extra participants) I understand those charges will be added to the balance owed. Party packages can only be modified up until the Wednesday before the party. A party confirmation call will be made on the Thursday before the party. I understand if I need to cancel my party I will not be refunded my deposit. In the event of an emergency I can change the date of my party with at least 7 days notice. I understand I will be charged for my party by number of actual participants. Participants are defined as any child who enters the gym and partakes in the party activities. I understand that this means if I have paid for a 12 person party and there are 13 participants I will be charged for the 18 person party. Any number over 18 is at a fee of $10.00 per additional child. 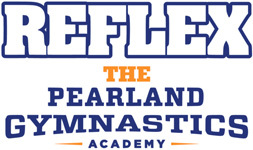 I understand that REFLEX will provide 2 (two) coaches for parties of 12 to 18 participants. Parties over 18 participants (by approval of the birthday party coordinator) will be provided with a third coach. Parties with over 18 participants must be confirmed 2 weeks in advance. I understand No Parent’s are allowed on the gym equipment at any time. This does not include entering the gym for the purpose of taking pictures. I understand no child can participate without a completed waiver by their parent or legal guardian. All children must have a signed waiver even current REFLEX members. NO EXCEPTIONS. I understand the party will be lead by the REFLEX staff member in a structured format. No party will be run in an “open gym” format. Only equipment that the REFLEX staff member has instructed to be used will be used. I understand I have an option to have one hour of gym time and 30 minutes of party room time or 50 minutes of gym time and 40 minutes of party room time. Children will not be allowed to reenter the gym area. I understand I have a 15 minute set up and clean up time. If I arrive early to the gym area I will not be permitted into the party room to begin my set up. Preceding birthday parties must be started on time. Tips are accepted and appreciated but not required. Tips are to be paid directly to the staff and cannot be charged to the credit card on file. Please note that date/time requests are NOT GUARANTEED until confirmed by RPGA. If you have not received confirmation from RPGA 48 hours after your inquiry, please contact us.